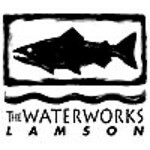 The Waterworks/Lamson is not a typical fly fishing company. They are C1 Design Group, and their core expertise is product design. They began to develop product ideas and explore the fly fishing market in 1995. They entered fly fishing as Waterworks. Late in 1998 they acquired Lamson from Sage Mfg. With the Lamson trademark acquisition, and the design work for Sage under their belts, they were ready to bring their own line of reels to market.